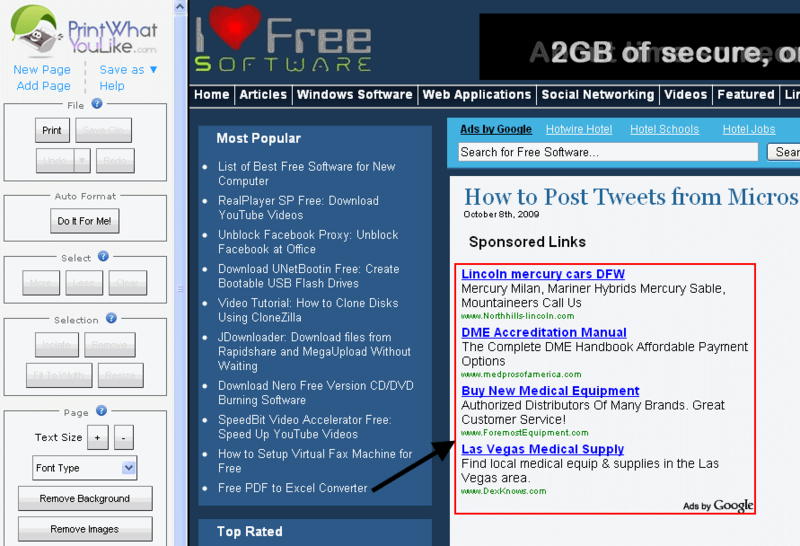 Whenever I want to print a webpage, biggest problem that I face is the ads on that page. Look around, you will see lot of ads here too :). Browsers do a very bad job at printing. They basically print whatever is available on the webpage, without providing an option to format it in any way. Here is an easy solution to the problem. PrintWhatYouLike is a free web application to format web pages before printing them. 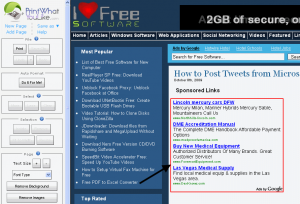 Its extremely simple to use, and completely free. To start, just go to PrintWhatYouLike website. On that, enter the URL of the webpage that you want to format. PrintWhatYouLike opens that web page in an online editor. All the controls to format the web page for printing are located in a tool bar on left side. One of the best feature that I like of PrintWhatYouLike is the ease with which it can remove ad blocks from any web page before printing. When you hover over an ad, PrintWhatYouLike highlights the block containing the ads. With just one click, you can delete that whole block. It’s as easy as that. I tried PrintWhatYouLike with a few different web pages, and found that it is very intelligent in stripping out ads, without removing other sections of a web page. Web pages normally have a colored background (like this one). When you try to print them using color printer, its a big drag on your ink as the whole page has to be printed in color. PrintWhatYouLike provides a way out to this too. On the left side toolbar, there is a button for “Remove Background”. As soon as you hit the button, PrintWhatYouLike makes the background of the web page White. This ensures that you do not have to waste any ink on printing background. Another good option that PrintWhatYouLike provides is to remove images from web page before printing. This lets you print just the text part, and not waste ink on images. 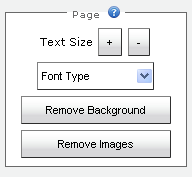 You can also increase or decrease font size of web page before printing it. An interesting option that PrintWhatYouLike provides is to convert any web page to PDF. On the left toolbar, just choose the option of “Save as”, and choose “PDF” from there. This will save your webpage as PDF. PrintWhatYouLike is a very practical service, and something that I think I will use quite often. Not only it lets me format the web page before printing, it would also save me on ink cost. I really liked its ease of use, and all the options that it provides. Best part is that it is completely free, and nothing to download or install. Whenever I want to print a webpage, biggest problem that I face is the ads on that page. Look around, you will see lot of ads here too. Browsers do a very bad job at printing. They basically print whatever is available on the webpage, without providing an option to format it in any way. Here is an easy solution to the problem.